"Making California History Come Alive"
66 kindergartners from Fairmont Elementary School in Vacaville visited Peña Adobe Park recently. They were joined by teachers Mrs. Smith and Mrs. Mac and 23 parents. The group spent three hours at the historic park learning about Vacaville’s history. Students were divided into five groups and rotated to five different stations, where they learned about the Peña family from fifth generation Cecelia Peña, and the Native Americans who lived here before the Peñas and Vacas from Apache decedent Armando Perez. 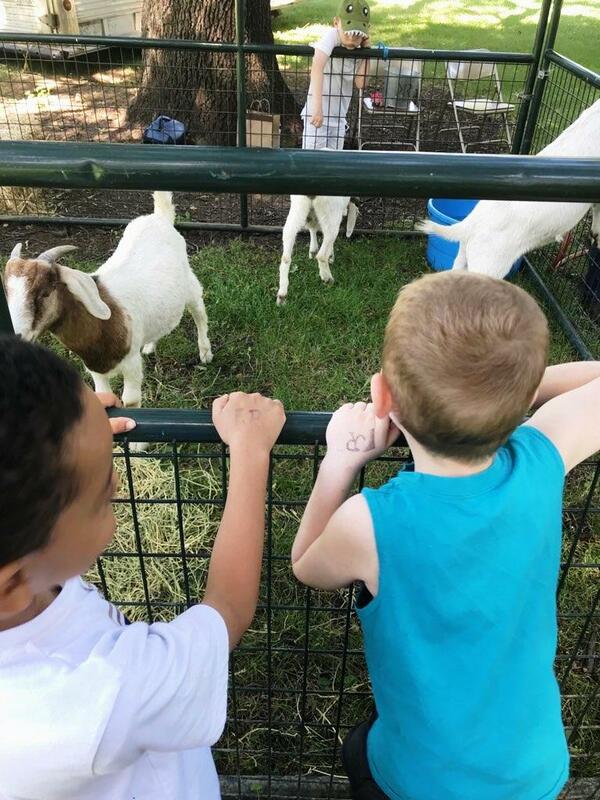 Students toured the Mowers Goheen Museum and saw a woolly mammoth bone and tooth before visiting with goats provided by the McQueeney Goat Ranch. The Wynholds family from Suisun brought a bunny and cavies, or guinea pigs, and the Castenada family of Vallejo brought their chicken and guinea pigs. Together they spoke to the group about the animals and 4H clubs. Later students all enjoyed their sack lunches before boarding their bus back to school. So long Fairmont Falcons, we hope to see you again!